Alfalfa Leaf, Burdock Root, Capsicum Fruit, Horsetail Herb, Devils Claw Tuber, Sarsaparilla Root, Hydrangea Root, Red Clover Herb, Yucca Root, Celery Seed. 320 GDU Units Bromelain, 10,000 Serrapeptase Units Peptizyme SP® EN, 6 MCU Units Papain. Plus The Following Natural Source Enzymes: Amylase, Protease, Lipase, Cellulase. Stearic Acid, Microcrystalline Cellulose, Calcium Stearate, Croscarmellose Sodium, Silicon Dioxide. 3-6 tablets daily, taken with food. Take 6 tablets for optimum benefits. Use 2-4 tablets daily for maintenance or for use with our other quality products like our Glucosamine/ Chondroitin/MSM liquid supplement. Alfalfa leaf, Burdock root, Capsicum fruit, Horsetail herb, Devil's Claw tuber, Sarsaparilla root, Hydrangea root, Red Clover herb, Yucca root, Celery seed. Plus over 72 ionic trace minerals found in seawater. 3-6 tablets daily, taken with food. Take 6 tablets for optimum benefits. Use 2-4 tablets daily for maintenance or for use with our other quality products like our Glucosamine/Chondroitin/MSM liquid supplement. 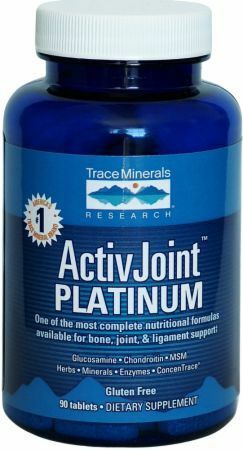 For almost 40 years, Trace Minerals Research has provided quality supplements to the natural products industry. 180 Tablets This is a Buy 1 Get 1 FREE offer!